PVNR Telangana Veterinary University/Teaching posts in P.V. 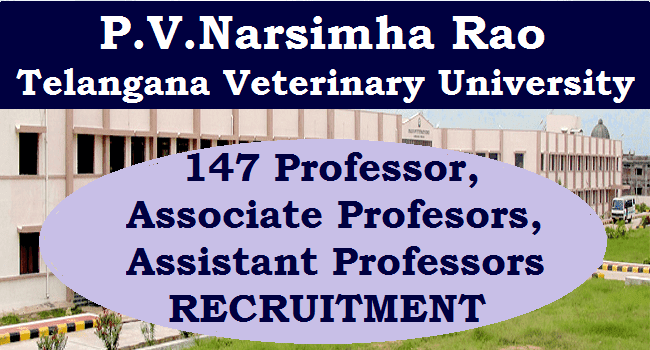 Narsimha Rao, Telangana Veterinary University/ PVNR Telangana Veterinary University Professors Recruitment 2017 PVNR 147 Professors, Associate Professors, Assistant Professors Recruitment 2017, GOVERNMENT OF TELANGANA, Public Services - AHDD & F Department - Filling up of (147) one hundred and forty seven vacant teaching posts by direct recruitment in P.V. Narsimha Rao, Telangana Veterinary University, Rajendranagar, Hyderabad- Orders - Issued. Read the following: 1. AHDD&F (AH) Department, U.O.No.117/AH(3)/2016, dt.29.05.2017. ORDER: Government have reviewed the Direct Recruitment vacancy position in P.V. Narsimha Rao, Telangana Veterinary University, Rajendranagar, Hyderabad. After careful examination of the proposal furnished by the Department and keeping in view the actual requirement of manpower with reference to the nature of work and activities of the university and also the overall financial implications, Government hereby accord permission to fill (147) one hundred and forty seven vacant teaching posts as shown below in various subjects of Veterinary science by direct recruitment as per the service regulations of P.V. Narsimha Rao, Telangana Veterinary University, Rajendranagar, Hyderabad. 2. The AHDD&F Department and the Registrar, P.V. Narsimha Rao, Telangana Veterinary University, Rajendranagar, Hyderabad, shall take necessary action for filling the respective posts duly following the Rule of Reservation, the provisions of the Presidential Order and the provisions of the Service Rules as applicable to the relevant posts. They shall adopt a transparent selection procedure for the purpose. The department shall obtain specific orders on the composition of the selection committee, selection process and other issues related to the recruitment process duly as per the relevant statutory provisions, following the rules of business. 3. The AHDD&F Department and the Registrar, P.V. Narsimha Rao, Telangana Veterinary University, Rajendranagar, Hyderabad shall furnish details of all vacant posts authorized in this order, including the local cadre wise vacancy position, roster points and qualifications, etc., to the recruiting agency immediately under intimation to Finance Department. The Department shall issue necessary amendments to their service rules / Government Orders as regards recruitment procedure / recruiting agency, wherever necessary, before issue of notification.